Cell signalling – insulin is a protein that binds to insulin receptors that will trigger a response by the human body to take up the excess glucose that is floating around in the blood. Structure – keratin is a type of protein that makes up our hair and nails. Immunology – antibodies that are made by the B-cells are proteins that help to destroy any foreign material within our bodies. Structure Level What is it? Secondary Formation of the alpha helices and beta pleated sheets through the interactions between the C=O and N-H groups of adjacent amino acids. 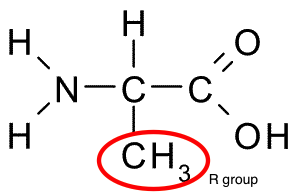 Hydrogen bonds is what maintains the two structures that form. Tertiary This is what gives the protein its final 3D shape. 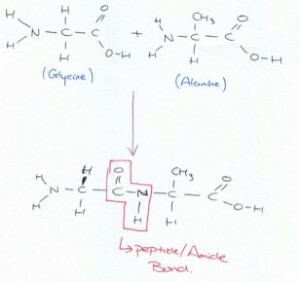 The interactions that happen here are crucial to the function of the protein. This structure arises through the interaction between the R groups of different amino acids. Bonds such as hydrogen bonds, ionic interactions dispersion forces, disulfide bridge etc… can exist that maintains this structure.